Working capital loans term loans or revolvers are the terms to define different types of loan agreements. This is basically an agreement between the lender and the debtor. 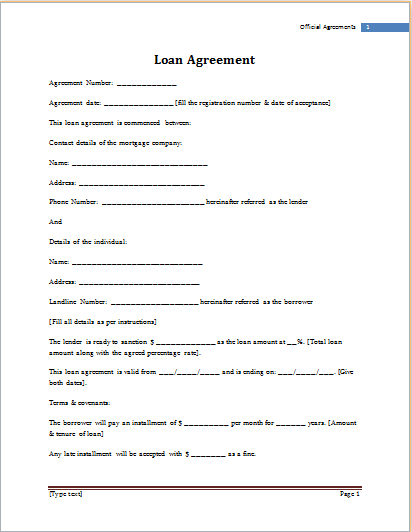 The agreement confirms that the loan is a liability upon the borrower which has to be paid for a fixed duration. Before compiling or sanctioning a loan the debtor has to show all his identification, his assets, cash and the most significant security or witnesses for the reliability of the borrower. Based upon such conditions the lender will decide to sanction or not sanction the loans and also the terms and conditions on which the loan has to be passed. Promissory notes or collateral contracts are the type of documents which comprises a section of loan agreements, the commitment and understanding are created through such agreements. The bank loan agreement is completely different from the agreement issued by finance companies as the bank gets a charter. It is crucial to avoid verbal agreement as it has no proof and a comprehensive written agreement is mandatory. If you are not finding yourself capable of writing an authentic loan agreement then you can take the help from online templates. They are completely free with a customizable option through which you can write your own loan agreement with detailed terms and conditions. What you have to do is just download the template and fill in your conditions.